The words stung. I knew they weren’t true. I knew they were being spoken from a place of hurt during a rough season in this person’s life, including challenging situations at church. 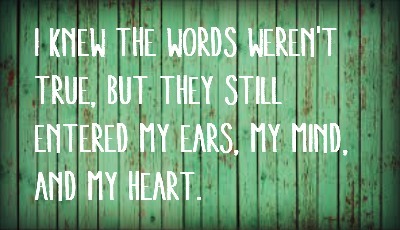 I knew the words weren’t true, but they still entered my ears, my mind, and my heart. Even though I knew the context in which the words were spoken, and I was able to let go of every other word-dart thrown at me during that conversation, that one sentence stuck with me. I caught myself second-guessing my leadership decisions, filtering and re-filtering my words before speaking, carefully choosing which ideas to share and what discussions to emphasize, especially when this particular person was involved in any way. I didn’t want to give her any more ammunition. But I already had. I had given her some power in my life that I didn’t need to relent. I knew what she said was untrue, but I went on the defensive, avoiding words and situations instead of living offensively. I don’t mean offensively as in aggressively attacking. I mean simply moving forward. I didn’t want to offend her, but I didn’t need to avoid her and her allegations either. To be honest, those words were said in such a heated moment that she probably doesn’t even remember them. It wasn’t as if it was characteristic of her. Why would I isolate something in her life? In fact, isn’t that what she had done with me in some way? Perhaps I should thank her. After all, the second-guessing, filtering, and carefully choosing that I consequently did wasn’t all bad. It was good exercise in discernment and patience. It probably helped some relationships and interactions, not to mention my patience and humility. No matter what, there is always something to learn in every situation. I’m thanking God for His reminder…and I’m moving on.